The emailer was DC Son from South Korea's Nasotec. 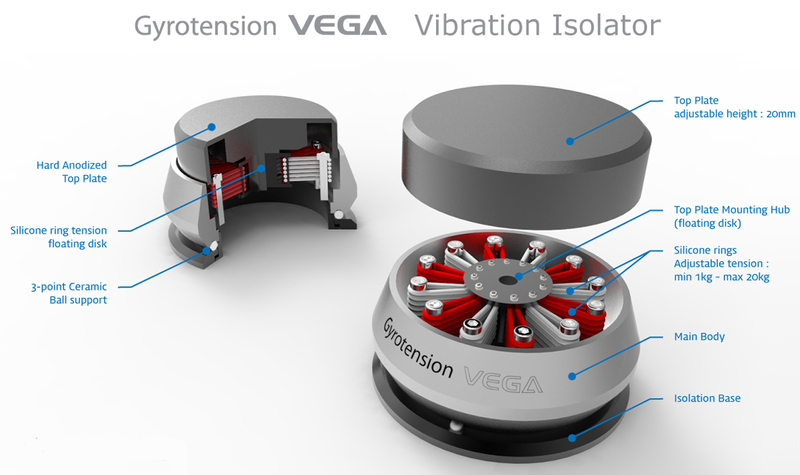 "I would like to introduce our Gyrotension Vega vibration isolators. This awesome product is made by HifiStay in Korea but our company Highendcity distributes it worldwide. I've attached photos and product descriptions." The Vega is described as a two-stage floating isolator. The base holds three ceramic ball decouplers. Beneath the height-adjustable top plate with central dimple to receive a spike sit 12 bolts in a circle. Affixed to them are stacked silicon rings. Those float the central shaft which supports the top plate. Each footer's max weight rating is 12kg for the small version, 18kg for the large. That means 36/54kg for a 3-point support respectively, with 4 points adding capacity. To match a footer's suspension compliance to a component's mass, one adds or removes string layers (four or six max for the small/large versions). Each silicon ring is ideally loaded at 250g or 0.55lb. The footer body is constructed of duralumin with hard-anodized top plate. It measures 6cm Ø and 4cm tall for the small version, 7.9cm Ø and 4.7cm tall for the large. Using a weight chart and assuming a 3-point support using the larger 6-layer Vega, one would set it to one layer for 1-9kg, add a layer for the next 9 kilos and so forth until maxing out at 54kg. Given my shelf-less Spanish Artesania Audio Exoteryc rack which eliminates traditional footers, I told DC that I'd be limited to my desktop's Eximus DP1 DAC/pre/headfi 3-in-1 driving Goldmund's Job 225. Alternately, I could use his snazzy footers beneath my 19kg Albedo Audio Aptica floorstanding speakers. Or under the very heavy Pass Labs XA-30.8 amp which sits between the speakers on our Rajasthani hardwood rack.